Family tree charts are an excellent way to share your research with your family, and to bring your family history to life. 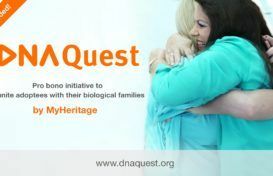 MyHeritage offers a wide selection of beautiful charts and books that can be created — for free — on your family site with a few clicks. Today we’re introducing a new addition to the lineup — The Sun Chart. This is an innovative new family tree chart for visualizing descendants in family trees. We call it a “Sun Chart” because the main ancestor (selected by the user) is shown in the center with multiple generations of descendants in outer concentric rings. It can be classified as a descendant fan chart, but it is unique in that it also includes photos, and it isn’t limited in the number of generations. The new Sun Chart is designed to be the most spatially efficient chart, and yet it still easy to understand. Do you have a family get-together or reunion coming up? Be sure to bring along a Sun Chart (or several, one for each of your ancestral lines), and everyone will ooh and aah over it! 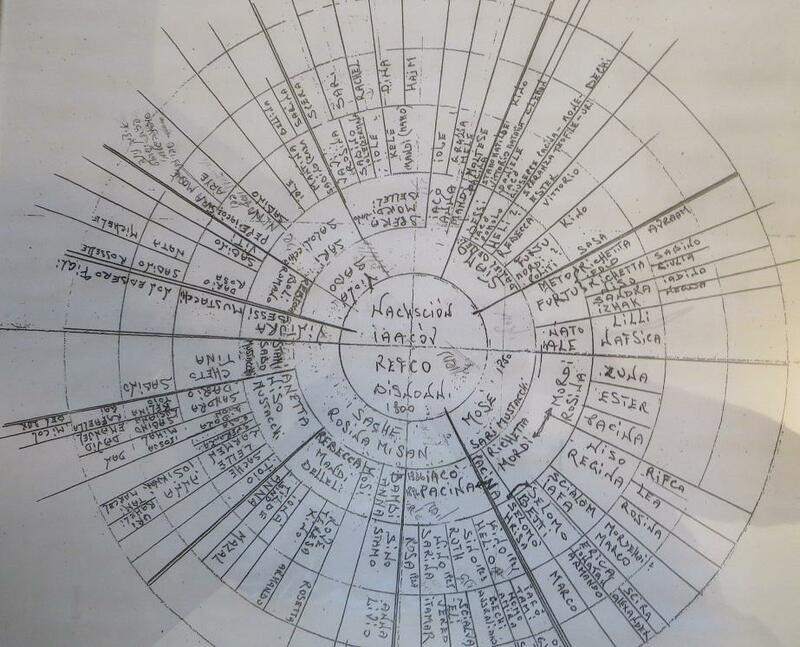 The chart above was prepared by MyHeritage Founder and CEO Gilad Japhet for his direct paternal line (Japhet/Pat) — showing the descendants of his great-great-grandfather. Click here to view the full PDF version of Gilad’s chart. Note that living people are displayed with initials to protect their privacy (this is one of the chart configuration options at the user’s disposal). Family history enthusiasts are always looking for the ideal chart for family reunions and other festive family events. A regular descendants chart, typically horizontal or vertical, can become enormous, too large and unwieldy to be practical for events or for hanging on the wall (unless you own a mansion). Descendant fan charts are a popular choice but, until now, they had limitations. They were limited in the number of generations and did not include personal photos. The Sun Chart is designed to plot as many descendants as possible on the smallest chart possible. Charts that include hundreds or even thousands of people can now be prepared in this compact circular format and hung conveniently on the wall. The Sun Chart includes high-resolution personal photos, making it the only descendant fan chart with photos that you will find anywhere. This unique chart is available only on MyHeritage — no one else can generate it for you. Furthermore, we developed an algorithm for making the Sun Charts even more compressed. It calculates every individual’s exact position to produce the smallest possible chart while rotating the rings with minimized spin so that descendants will be shown as close as possible to their parents. All this is done while maintaining clarity even at high levels of compactness, and the compactness is a parameter that the user can control. The design of the Sun Chart was inspired by a family tree format that the MyHeritage research team came across several times while conducting pro bono research related to the Jewish community of Corfu, Greece. The chart format that we discovered had been used for centuries by that community. Our researchers immediately understood the unique advantages in such a chart. Its brilliance lies in the way that a different segment (variable degrees) is allocated for each person depending on the number of descendants he/she has, and the simple way it can be extended over time as new family members are born. MyHeritage recently showcased a Sun Chart while reuniting Nata Gattegno, a 93-year-old Holocaust survivor from Corfu, with her relatives. Although she thought she was alone in the world, our research uncovered cousins that Nata never knew existed or lost touch with many users ago. The following video is an excellent example of the excitement and impact that this type of chart can have when printed and used. The Sun Chart makes an appearance around minute 3:10 in the video and includes about 900 people. The Sun Chart is free, and all MyHeritage users can enjoy it right now. On your family site on MyHeritage, under “Family tree,” choose “Print Charts and Books”. Select “Sun chart”. In the “Customize the chart” section, choose the main ancestor for the chart, enter the chart title, pick the number of generations to display (default: all generations) and select the facts to be displayed (no facts, years of birth and death, full dates of birth and death, or full dates and place names of birth and death). If the main ancestor has more than one spouse, choose which one to use for the chart. Under “Settings,” you can change all aspects of the chart and preview the changes. Here you can modify more settings, such as the size of text fonts and personal photos (default is Large for both), the level of compactness of the chart, and whether to include spouses (if not, only blood relatives are shown). The chart compactness setting allows you to control the trade-off between chart compactness and clarity. Less compact charts can be clearer to follow but will require a larger size when printed. “Extreme” compactness will produce the smallest chart possible, but note that such a chart may become less readable as children may be displayed further apart from their parents. Once you are happy with the chart, click “Generate Chart” and wait for it to be prepared as a PDF file. You can then download it to your computer, and it will also be emailed to you automatically. You can print it yourself at home or use a professional printing company, or email a copy to your family members. We also provide an integrated poster printing service where you can order a lovely poster of your family tree and – with international shipping – have your chart delivered anywhere in the world. We offer a variety of paper types (including standard paper, matte photo, glossy photo, vinyl, and canvas), in sizes of up to 42 inches/107 cm (smallest dimension) and with optional lamination. Upload as many personal photos as you can to your family tree. This will help bring your family tree to life, and more photos will make a much more appealing Sun Chart. New to MyHeritage? Sign up from the homepage and upload your family tree as a GEDCOM file, and you can immediately create a Sun Chart for your family. Sun Charts are another example of MyHeritage’s drive to continuously innovate and push genealogy and technology forward, even in traditional areas where one could have thought there was no room left for further development. Family tree charts have been used for centuries without much change and improvement — until now. We combine our cutting-edge technologies with the wisdom of past generations to bring our users new enhancements for their family history experiences. We hope that you’ll enjoy creating Sun Charts for your family! I just am amazed that I found so many of my family! Starting with two sets of grandparents and going out from each one of them. I’m so happy that I got the bundle package. I now have generations of people from Germany and from England back to the 14th generation. Thanks! My Heratage. I’m having a good time resourcing my history. Very nice, but I’d find an ancestors version much more interesting and useful, especially if it could go back a variable number of generations and get printed on A4 or A3 paper. Looks very good. I haven’t been on the site for some time now. The Sun Chart is free for all MyHeritage users. Been using the site for 5 years and have found so many relations I didn’t know I had. User friendly and helpful and a great support team thats gives answers to those odd questions. Now have my direct line back to the year 720. Brilliant idea. I created a similar chart many years ago using my daughter as the middle point with the outer spokes being her ancestors. The only problem with all charts, as mentioned by Paul, is that you need large sheets of paper to print your full tree. ….. I have a family wheel which I copied from one which my father did for himself in the 1930s. This family wheel looked very like your Nacson example and had my father and his brother in the centre, his parents in the first ring, Grandparents in the second and so on. ….. Mine has my sisters and myself in the centre, my parents in the first ring an so on. Of course, I have had to fill in the whole right hand side of my wheel, because it is that side which shows my mothers ancestors. ….. The wheel is great for antecedents, because they double for each generation (2, 4, 8, 16, 32 etc) and each ring of the wheel gets bigger with each generation, but is not as good as a tree for descendants, because two parents can have 15 children, or no children and the wheel is difficult to create and impossible to follow. ….. I have seen a very old published family wheel for Queen Victoria. 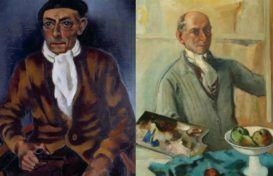 This could have been where Daddy got his inspiration and could even be where your Nacson family got theirs. I agree with Paul’s comment. An ancestors option would more useful for me. Thank you for the new option for mapping. The Sun chart looks very interesting. Thank you for the clear instructions. Thank you! The current format is getting difficult to find particular ancestors on the tree when you’ve traced back to the dark ages. A great idea and should be of interest to younger generation too, is it available for the my heritage ap for iPad?? I love the sun chart. And, while it is free to generate, if you want to order a chart there is a cost. I generated a nice tree (6 generations) that started with one of my second great-grandfathers at the center. When I went to print it for myself, it all went on one piece of paper so it is really tiny. MyHeritage says you can save it as a pdf file and bring it somewhere to be printed. Anyway, haven’t done this yet but I do love the concept and this would be great for a family reunion. I agree with Karen’s remark and have requested before that a “pedigree” view option at MyHeritage is really needed. People can’t navigate the tree easily. It sounds good I would love to try it, is it hard to do? My Heritage Creative Creators, I am enjoying your site so much. This new idea sounds great. I will register my delight on this new aspect as I work through it. You must be a collection of really dedicated people. Thank you for your great work & keeping us in the picture. An ancestor sun chart would be fantastic. I’ve done my own based on a square grid format but this would be much better going back for 14 generations. It looks great ! Only one thing I can’t see, which would be very handy, is the option to put on people’s occupations. But for a standard descendant tree it certainly looks lovely. You never fail to amaze me from a disc with the latest software to this stunning new innovation. The sun dial chart. I certainly get my money’s worth from my subscription. Thank you so much, mostly for caring for your ‘My Family members’. That is very ingenious. Congrats! Wow I like this . It will be nice to put it all togerher in a big sun and put on my wall. I have been creating my own circular ancestral (ten generations) and descendant charts for about 40 years, drafting my own base charts. The descendant charts are more complicated and it is difficult when one family has many children. My ancestral chart is 36″ x 36″ and the writing on the last generation is very small. It is nice to see My Heritage generating the charts and offering to print them. I just finished putting together a 5 generation descendants chart for a family reunion and found it a great way to help people visualize the relationships in a compact format. I put my grandparents on my mothers side in the centre and plugged it into my information, and le voila.